Evidently today is World Wide Knit In Public day. uhm... maybe better fits in here? 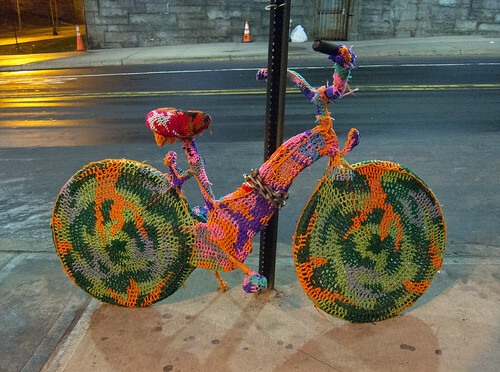 @laughingsquid spots a Yarn Bike in Brooklyn and we say, “Go BROOKLYN!” That’s the work of Olek. Also see Yarn Bombers. Uploaded by Laughing Squid | more from the Bike Hugger Photostream. But is is RIDABLE, ed gruberman? So I've been crocheting a ton lately - in the past 2 months, I've made 2 hats - one for my baby and one for me, and a stuffed dog for my 7.5 year old daughter. Now I'm working on slippers for me. You might want to get in contact with my sister, as she used to do quite a bit of crochetting a while ago. I don't know if she's doing as much now, but she may have pointers, ideas, etc. of use to you. there is worse to do with your time. I love crochet, I recently made some coaster doilies, because I have hobbies of 12 year old boys and 80 year old women. I know a high school boy that does crochet items for girls. He is not stupid. Girthta really got into crocheting, but I don't know how much of it she does now. Well maybe she should come and tell us about it! I would be interested in starting. I would google the best starting materials, but I trust the "Uncensored" cit community to help me out. I'd start with peaches and cream yarn, it's a natural fiber(acrylics can be annoying to work with) and it's not stretchy, so it'lll help you figure out tension. It's also sold just about everywhere that sells yarn at all. The wrapper will tell you what size hook to get, and I suggest you get a size larger and a size smaller as well. Did she die in a car fire? If so, someone else has her voice, and has stolen her husband and child. Which is possible. I should look into it. I am assuming that fleeb went to look for girthta and got eaten by whatever predator (a grue?) got her as well. He hasn't been back since the day he posted that. Gads, that has been a while. And... well... the world seems to have become a little more depressing. The world may be more depressing, but we'll do all we can here to make it entertaining throughout the apocolypse. Hi! My name is Nero. Would you like to hear me play the fiddle?